Funding Analyst works and deals directly with the credit department, sales department, vendors and see to it that they adhere to the state, federal credit rules and regulations. 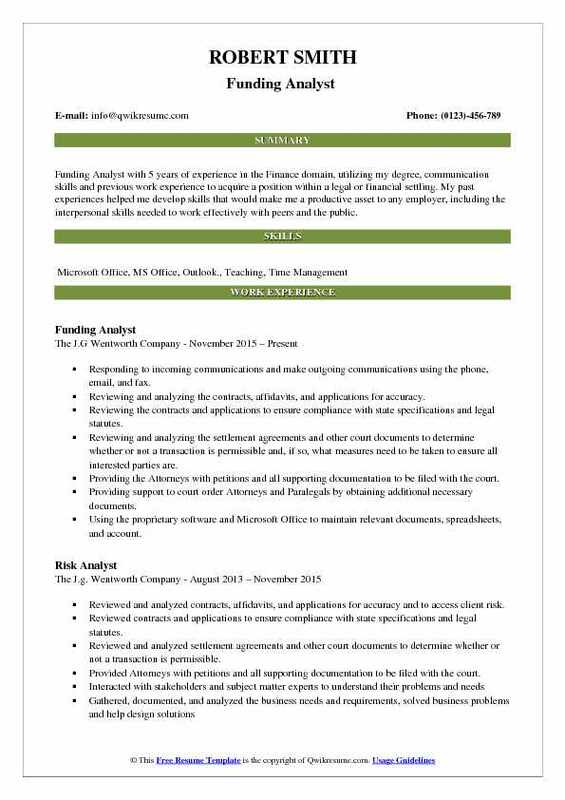 The other major responsibilities for a funding analyst include – receiving, processing and extracting of financial data and documents, responding to client needs by providing the essential information, analyzing data, suggesting a course of action, produce visualizations, handling correspondence and communications, verifying the authenticity of the debtors and their financial details. 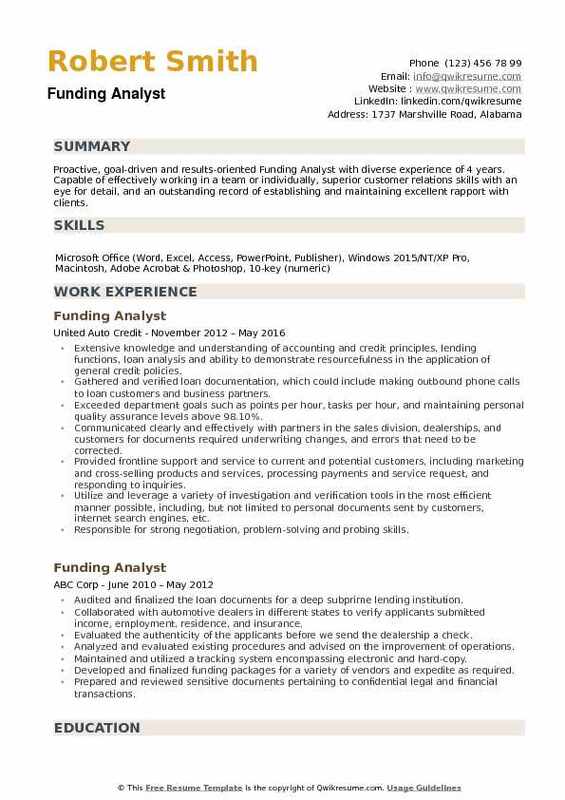 The role of a funding analyst is as wide as the job description for a Funding analyst differs from company to company, some companies may require a loan funding analyst, while some need a bank funding analyst, hence candidates willing to make a career as a funding analyst should frame a Funding Analyst resume sample by projecting their specialization area. To become a funding specialist, a person should possess a graduation certificate in any of the following subjects – Economics, investment analysis, taxation, accounting or finance. However, MBA, CA and a postgraduate in management or finance get a rewarding pay package for this post. 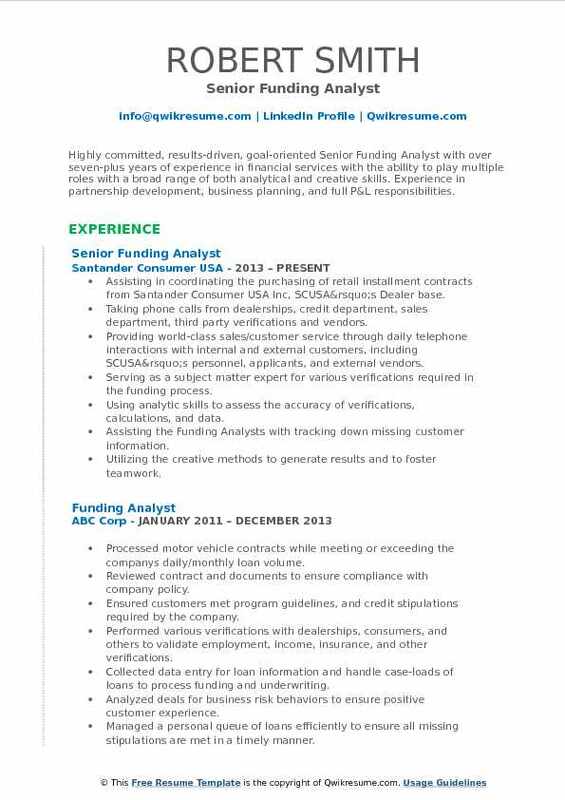 Headline : Funding Analyst with 5 years of experience in the Banking domain. Utilizes analytical, communications, training in obtaining a position within a multi-loan company as a Loan Administrator and/or utilizing skills as a Human Resources Assistant. Took responsibility to keep up to date with changing regulations and policies. Assisted in the preparation of other management reports and special projects. Ensured compliance with applicable federal, state and local laws and regulations. Maintained knowledge of and adhere to Flagstar's internal compliance policies and procedures. Kept in close contact with companies ( Flagstar Bank, Nationstar, U.S. Bank, Regions Bank and Fannie Mae). Provided funding for loans in amounts of $150,000-$500,000 daily but limited to a million dollars. 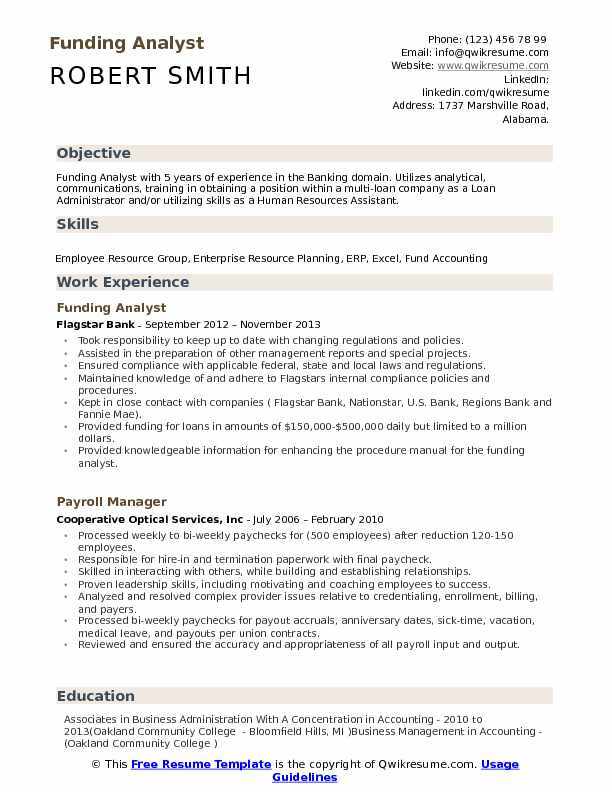 Provided knowledgeable information for enhancing the procedure manual for the funding analyst. Demonstrated the ability to work in a team environment (to include interaction with various levels of management and lending staff), as well as the ability to take initiative and work independently. Reviewed, monitored and provided loan recommendations that are properly structured and accurately risk graded. Provided loan grade change recommendations and maintained documentation supporting all such changes. Evaluated the overall creditworthiness and repayment capacity of a borrower, including analyzing complex financial statements. Summary : Innovative, self-motivated Funding Analyst with a comprehensive background of 11 years in finance and sales, specializing in budgeting and calculating risk. Calm demeanor in the face of difficulties; successfully completes projects in high-pressure environments. Highly versatile; quickly masters new roles, responsibilities, and technologies. Reputation for integrity, work ethic, and dedication. Assisted loan servicing by analyzing data and reducing the risk for one of the largest sub-prime auto lenders in the nation, originating over $4 billion in subprime auto loans per year. Achieved top performer 4 years in a row funding over $9 million sub-prime auto loans. Successfully maintained an average over 125% to goal for deals funded. Led, managed and executed training of 40 new associates by calibrating the quality of work to determine readiness for the position of a funding analyst. Proactively created and organized a relief team to support regional teams to ensure customers needs were met in a timely manner. Conducted and participated in leadership staff meetings as well as department focus meetings. Proactively found a more efficient process to save the company money by verifying vehicles add-on by utilizing the internet, which assisted loan servicing and vehicle remarketing department by charging back dealers add-on that was not on the vehicle. Utilized internet and proprietary software to verify related customer information and communicate applicant account status. Responsible for inbound and outbound calls to verify data provided by the applicant. Assisted the Manager in reviewing reports involving department goals to achieve turnaround time goals. 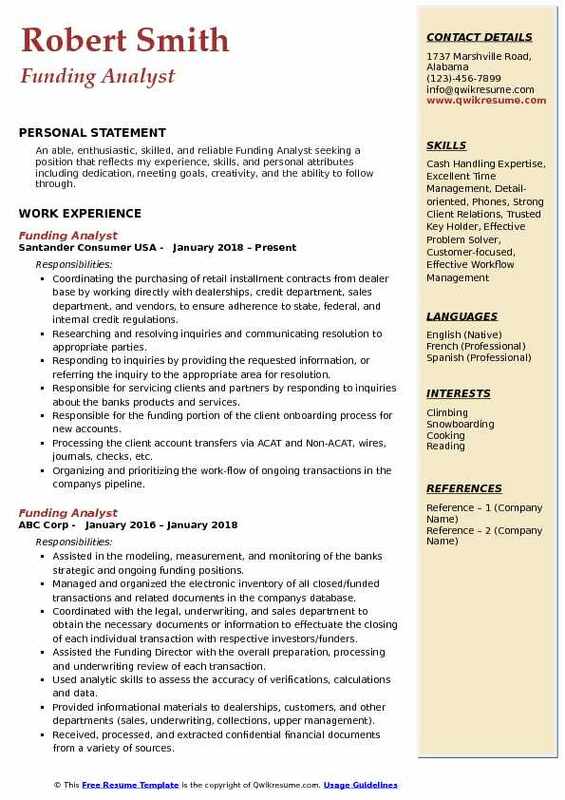 Headline : Funding Analyst with 5 years of experience in the Finance domain, utilizing my degree, communication skills and previous work experience to acquire a position within a legal or financial settling. My past experiences helped me develop skills that would make me a productive asset to any employer, including the interpersonal skills needed to work effectively with peers and the public. Responding to incoming communications and make outgoing communications using the phone, email, and fax. Reviewing and analyzing the contracts, affidavits, and applications for accuracy. Reviewing the contracts and applications to ensure compliance with state specifications and legal statutes. Reviewing and analyzing the settlement agreements and other court documents to determine whether or not a transaction is permissible and, if so, what measures need to be taken to ensure all interested parties are. Providing the Attorneys with petitions and all supporting documentation to be filed with the court. Providing support to court order Attorneys and Paralegals by obtaining additional necessary documents. Using the proprietary software and Microsoft Office to maintain relevant documents, spreadsheets, and account. Using effective time management skills to process all incoming documents within a reasonable time frame. Reviewing the files of colleagues to ensure compliance with state specifications and legal statutes as well as company guidelines, and approve files for funding. Summary : Highly committed, results-driven, goal-oriented Senior Funding Analyst with over seven-plus years of experience in financial services with the ability to play multiple roles with a broad range of both analytical and creative skills. Experience in partnership development, business planning, and full P&L responsibilities. Assisting in coordinating the purchasing of retail installment contracts from Santander Consumer USA Inc, SCUSA’s Dealer base. Taking phone calls from dealerships, credit department, sales department, third party verifications and vendors. Providing world-class sales/customer service through daily telephone interactions with internal and external customers, including SCUSA’s personnel, applicants, and external vendors. Serving as a subject matter expert for various verifications required in the funding process. Using analytic skills to assess the accuracy of verifications, calculations, and data. Assisting the Funding Analysts with tracking down missing customer information. Utilizing the creative methods to generate results and to foster teamwork. Communicating with consumers, dealers, and credit support services and a daily basis. Assuring the timely processing of contracts, documentation and credit verifications on pending new loan accounts. 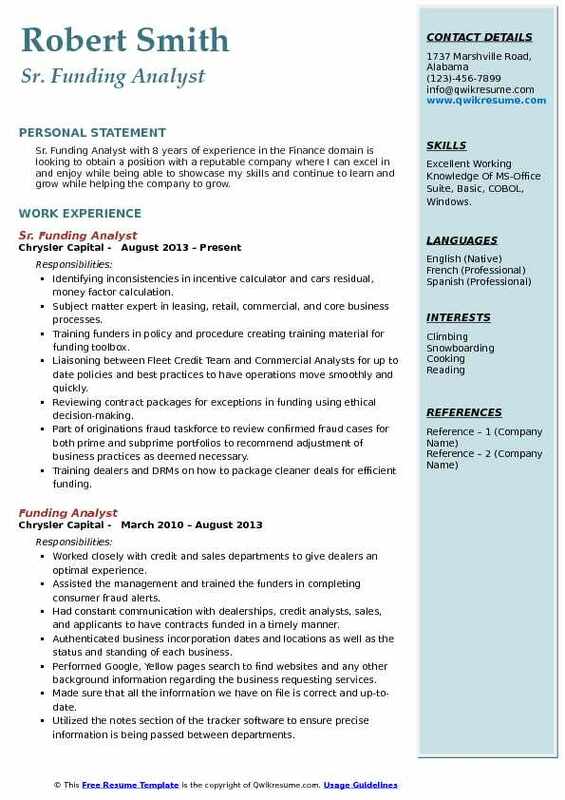 Summary : Sr. Funding Analyst with 8 years of experience in the Finance domain is looking to obtain a position with a reputable company where I can excel in and enjoy while being able to showcase my skills and continue to learn and grow while helping the company to grow. 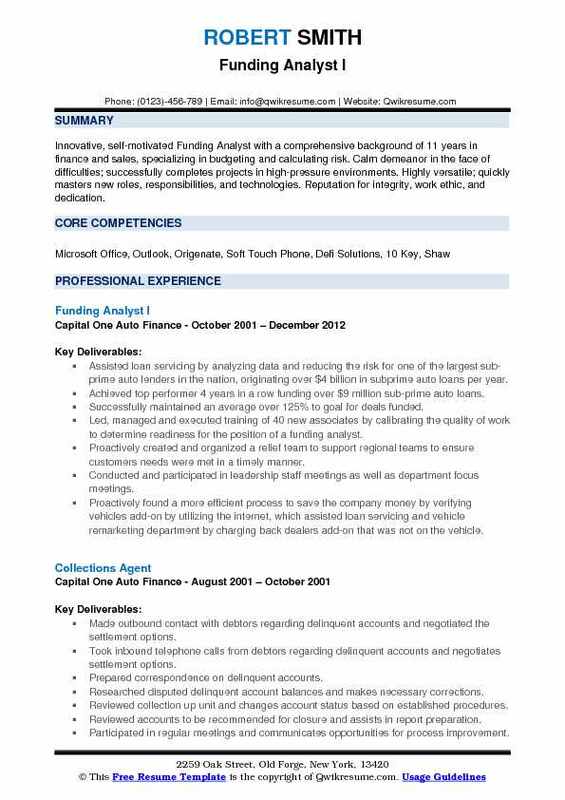 Skills : Excellent Working Knowledge Of MS-Office Suite, Basic, COBOL, Windows. Identifying inconsistencies in incentive calculator and cars residual, money factor calculation. Subject matter expert in leasing, retail, commercial, and core business processes. Training funders in policy and procedure creating training material for funding toolbox. Liaisoning between Fleet Credit Team and Commercial Analysts for up to date policies and best practices to have operations move smoothly and quickly. Reviewing contract packages for exceptions in funding using ethical decision-making. Part of originations fraud taskforce to review confirmed fraud cases for both prime and subprime portfolios to recommend adjustment of business practices as deemed necessary. Training dealers and DRMs on how to package cleaner deals for efficient funding. Scrutinizing the authenticity of documents received by consumers and dealers to detect fraud and minimize company losses. Reviewing the consumer credit reports to ensure contracts were within company policy and ratio calculations- debt to income, payment to income, and loan to value. Objective : Junior Funding Analyst with 2 years of experience wants to acquire a long-term position in a people-oriented organization where I can maximize my extensive skills and experience while enhancing the company brand name. Analyzed bank and credit card statements as per company guidelines to verify that the merchant qualifies to continue with the loan/cash advance process. Utilized both Experian and Equifax reports to validate company/personal information using the credit bureau reports and the criteria set forth by the company guidelines. Ensured the timely and accurate processing of all loans originated by the Credit Analyst. Input proper loan information into the system for processing. Responsible for ensuring that all loan documentation is complete accurate verified and complies with company policy. Performed advanced level of verifications to ensure credit guidelines are achieved. Used analytical skills to assess the accuracy of verifications, calculations, and data. Managed a book of customer files with limited supervision or guidance. Made outbound calls to customers, employers, and dealers as needed for completion of the review. Closely inspected the loan package documentation for fraudulent or questionable documentation. 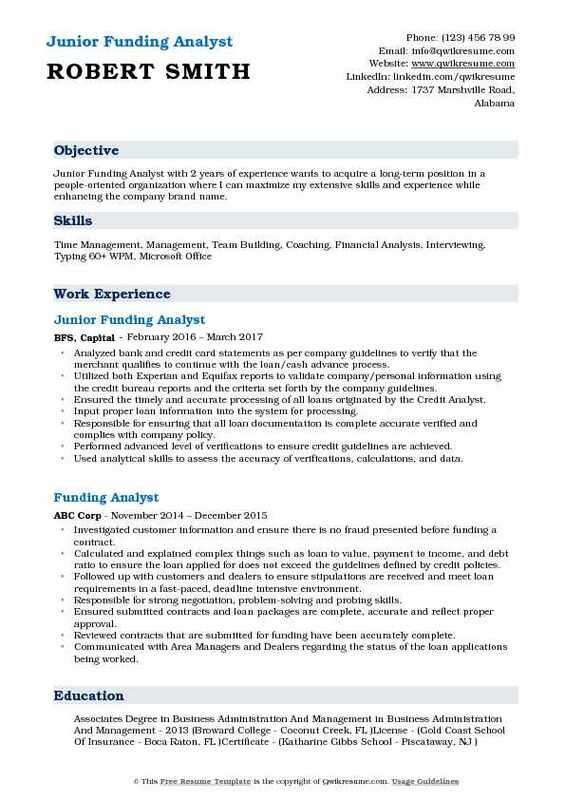 Objective : Self-motivated Jr. Funding Analyst, highly proficient in developing creative solutions in the workplace. Maintains a positive attitude and works hard to build team relationships. Customer service focused with prior management experience. Seeking to obtain full-time employment in a position to grow as a professional and utilize the skills obtained from education and work experience. Performed checks for state and federal regulatory requirements, as well as appropriate lien perfection documents. Analyzed automobile contract for accuracy, documents, follow up on needed documents, dealer customer service. Analyzed auto loan and lease deals and ensure all paperwork needed is present and accurate while adhering to federal guidelines. Made outbound phone calls to dealerships to advise of any missing documents or corrections needed. Provided world-class customer service through daily interaction with both internal and external customers, including personnel, automotive dealerships, vendors, and customers. Reviewed credit reports for open autos, bankruptcies, and any mismatch information pertaining to customers identification. Worked with the dealer and customer to receive documentation/information needed to process the loan. Summary : A diligent, proactive and results-oriented Funding Analyst with 15+ years of experience in all aspects of Funding Management. Experience in human resources and insurance benefits administration. Currently working in a fast paced high volume environment examining and processing time sensitive auto loans utilizing accuracy and speed in analyzing financial data, evaluating and verifying all legal documents required for approval. 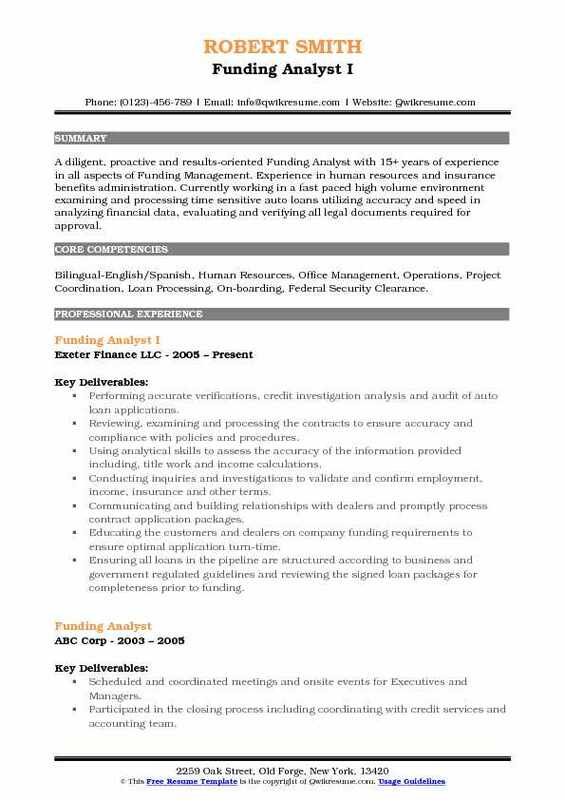 Skills : Bilingual-English/Spanish, Human Resources, Office Management, Operations, Project Coordination, Loan Processing, On-boarding, Federal Security Clearance. Performing accurate verifications, credit investigation analysis and audit of auto loan applications. Reviewing, examining and processing the contracts to ensure accuracy and compliance with policies and procedures. Using analytical skills to assess the accuracy of the information provided including, title work and income calculations. Conducting inquiries and investigations to validate and confirm employment, income, insurance and other terms. Communicating and building relationships with dealers and promptly process contract application packages. Educating the customers and dealers on company funding requirements to ensure optimal application turn-time. Ensuring all loans in the pipeline are structured according to business and government regulated guidelines and reviewing the signed loan packages for completeness prior to funding. Reviewing the newly cleared to close loans to ensure that all required forms and/or documentation have been provided for closing. Objective : An able, enthusiastic, skilled, and reliable Funding Analyst seeking a position that reflects my experience, skills, and personal attributes including dedication, meeting goals, creativity, and the ability to follow through. Coordinating the purchasing of retail installment contracts from dealer base by working directly with dealerships, credit department, sales department, and vendors, to ensure adherence to state, federal, and internal credit regulations. Researching and resolving inquiries and communicating resolution to appropriate parties. Responding to inquiries by providing the requested information, or referring the inquiry to the appropriate area for resolution. Responsible for servicing clients and partners by responding to inquiries about the bank's products and services. Responsible for the funding portion of the client onboarding process for new accounts. Processing the client account transfers via ACAT and Non-ACAT, wires, journals, checks, etc. Organizing and prioritizing the work-flow of ongoing transactions in the company's pipeline. 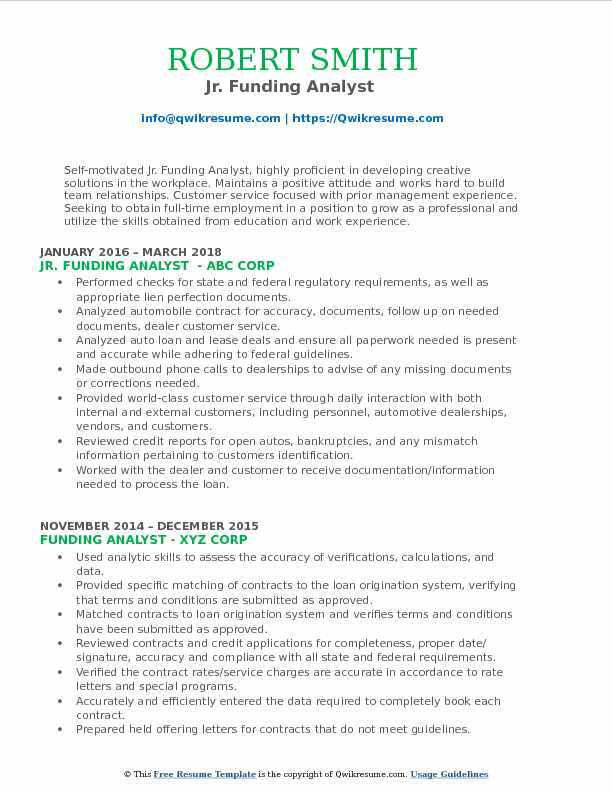 Objective : Proactive, goal-driven and results-oriented Funding Analyst with diverse experience of 4 years. Capable of effectively working in a team or individually, superior customer relations skills with an eye for detail, and an outstanding record of establishing and maintaining excellent rapport with clients. Extensive knowledge and understanding of accounting and credit principles, lending functions, loan analysis and ability to demonstrate resourcefulness in the application of general credit policies. Gathered and verified loan documentation, which could include making outbound phone calls to loan customers and business partners. Exceeded department goals such as points per hour, tasks per hour, and maintaining personal quality assurance levels above 98.10%. Communicated clearly and effectively with partners in the sales division, dealerships, and customers for documents required underwriting changes, and errors that need to be corrected. Provided frontline support and service to current and potential customers, including marketing and cross-selling products and services, processing payments and service request, and responding to inquiries. Utilize and leverage a variety of investigation and verification tools in the most efficient manner possible, including, but not limited to: personal documents sent by customers, internet search engines, etc. Responsible for strong negotiation, problem-solving and probing skills. Investigated financials such as income from salaries, retirement, and SSI in order to prove the legitimacy of such income.